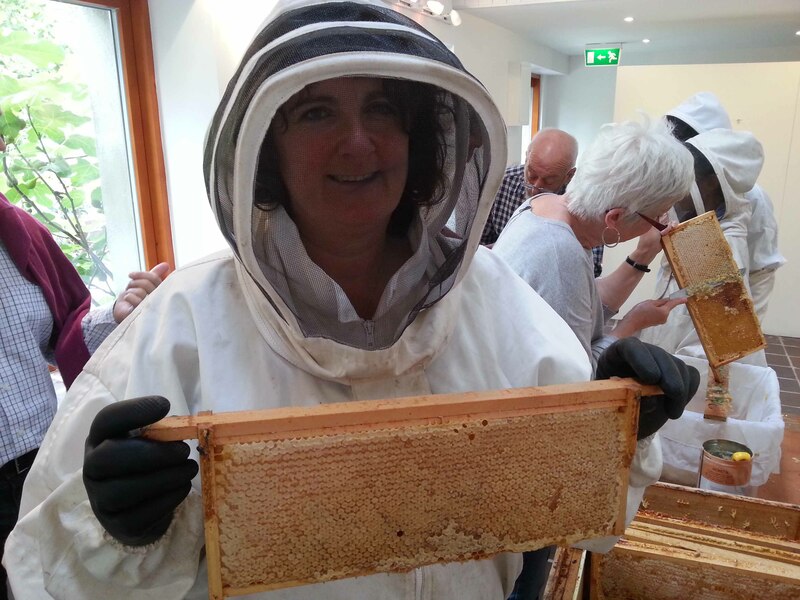 The year 2015 was a momentous one for the pollinators when Biodiversity Ireland brought together a diverse range of people to begin a plan of action they hope will save these important insects. Sixty eight organisations from across the island, including the Community Gardens Ireland who I represented, agreed they would help to carry out five plans of action over the coming years in a 2015-2020 Pollinator Plan. During the past thirty years, more than half of the bee species in Ireland have declined substantially, with 30% now threatened with extinction. It’s clear that this can’t continue and as many of the reasons for the decline are man-made, it’s not before time that we attempt to reverse the trend. Making Ireland and Northern Ireland pollinator friendly by focusing on actions that can be taken privately and publicly. 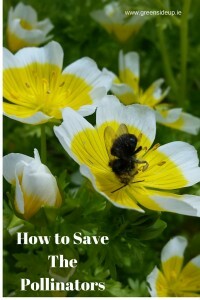 Raising awareness of pollinators and how to protect them. Expanding our knowledge on pollinators and pollination service. Collecting evidence to track change and measure success. Upon launch, the Plan was picked up by media around the country but as we head into the new year, and with it thoughts of abundant summer gardens, it’s important we don’t forget to include these important little creatures in our planting schemes. 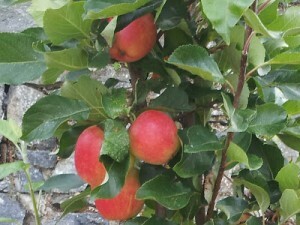 Several fruit and veg varieties grown in Ireland depend upon pollinators including apples, blackcurrants, pumpkins and squashes, strawberries, blueberries, raspberries and blackberries. It’s also *been shown that animal pollinated crops are able to provide vitamins, antioxidants and other essential nutrients to the human diet as well as improve the nutritional value of some crops. Apart from the fact is seems morally wrong to do nothing, for nutritional reasons hand pollination should only be considered as a last resort. Food crops aside, pollinators are important in our floral world too. It’s been estimated that 78% of flowering plants need animal pollination – what a bare island we’d live on without the bees and hoverflies! Some pollinators such as hoverflies (of which there are 180 species in Ireland) don’t just pollinate plants, they help organic growers fight pests too. Hoverfly larvae feast on aphids so planting flowers around our gardens such as Limnanthes that attract them, helps to keep aphid numbers down and cut the need for spraying. There are several things we can do to help pollinators; choosing just one or two would be a great start for the year. 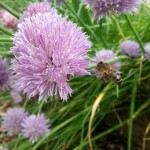 I’ve written several articles on ways we can avoid using chemicals and sprays in the garden. Perhaps 2016 will be the year that the tide turns and people stop using them. 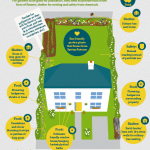 There are all sorts of pressures on Ireland’s pollinators that include loss of habitat, hunger, sickness, changing environments; however, poisoning is another and it’s preventable. Avoiding the use of neonicotinoids as well as herbicides that kill essential food sources for pollinators would help to see an improvement in numbers. This article gives 16 natural alternatives to herbicide and pesticide use that you might find helpful to make the switch. 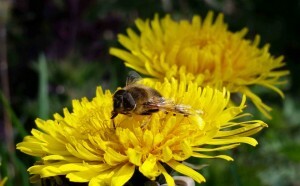 “Evidence from the USA showed that dandelions and white clover on lawns supported 37 species of bee. White clover was important for bumblebees and honeybees, whereas solitary bees, honey bees and hoverflies predominated on dandelion”. From our own point of view as novice beekeepers, we’ve learnt that dandelions are one of the first ‘weeds’ that honey bees feed on when they come out of spring hibernation. Pollinators don’t differentiate between ornamental, hedgerow or wild flowers; they’re all food sources. 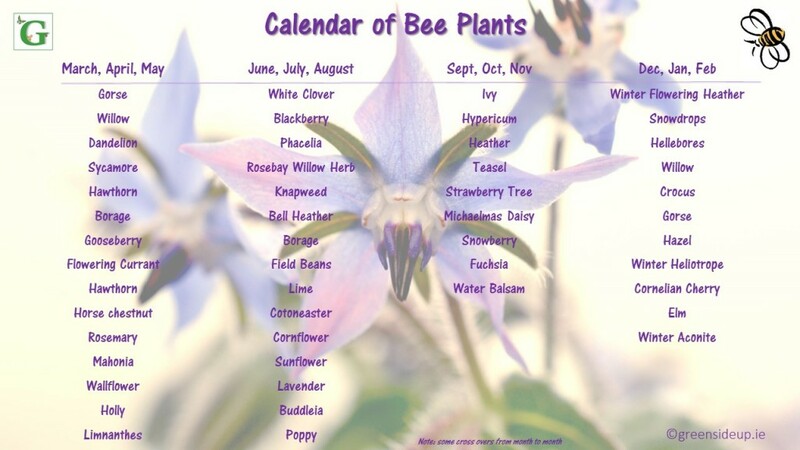 The following is a monthly flowering calendar of plants that bees enjoy, some of which you might like to include in your garden planting schemes this year. You can also find more detailed information about planting for pollinators in an article I wrote in March 2015. 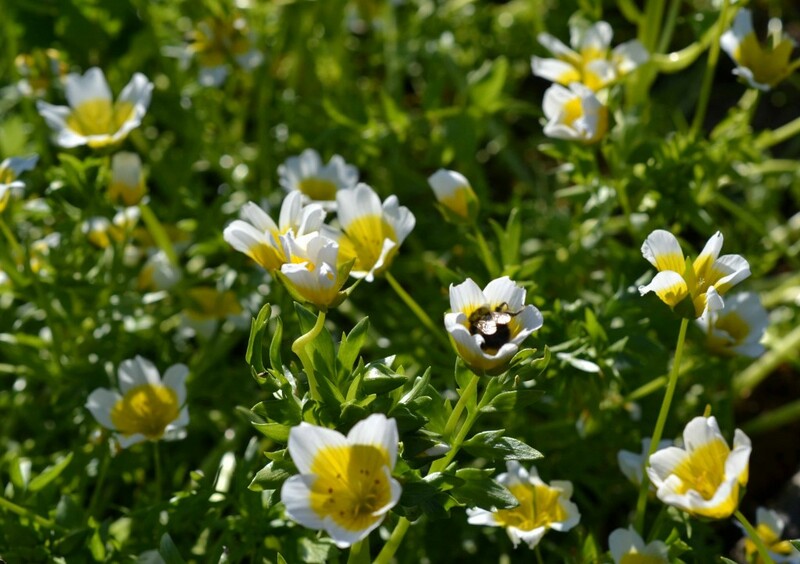 The Bumblebee Conservation Trust have a useful online tool that can help you find what flowers in your garden are bee friendly and make suggestions to help you choose more. Over 80% of Ireland’s solitary bees are mining bees who nest in bare ground or south-facing slopes but the remaining 20% look for cavities to nest in. Whilst not a large number, building a bug hotel for solitary bees is a cool project to do with kids or groups and will enhance your garden too. Here’s an example of one I made with a group of intellectually disabled adults last year. Biodiversity Ireland are building a database of pollinators in Ireland and Northern Ireland that will help to give a clear picture of the changes in populations and to help to track changes in wild pollinators. 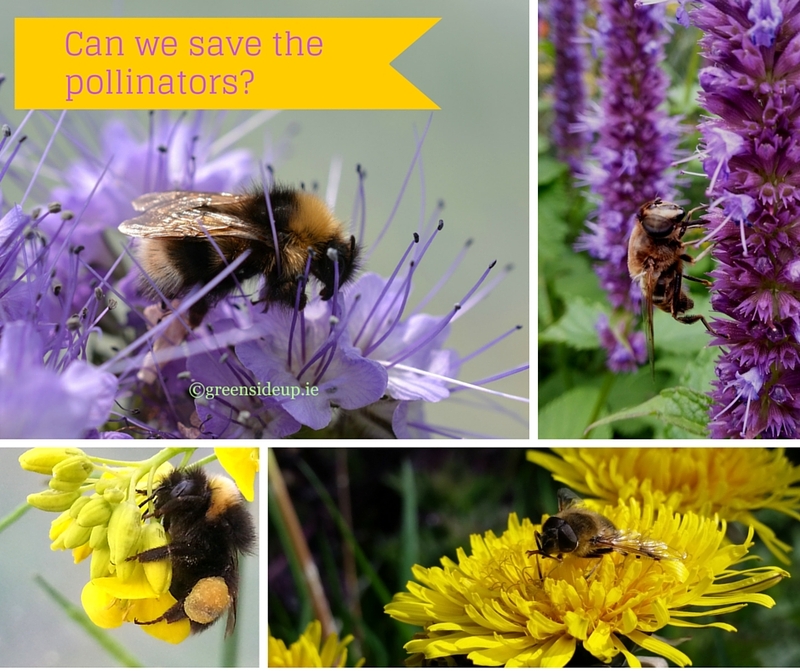 The Pollinator Plan includes other suggestions for improving the habitats of pollinators such as planting wildflowers along roadside verges, allowing field verges to grow wild and planting wildflower patches. The full document is available here in PDF format. 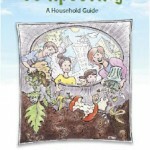 Hardback copies are available from Biodiversity Ireland upon application. Will you help? What’s the first thing you’ll do or change to help the pollinators? If your group or club would like to learn more about pollinators, contact me for information about talks. *all facts given are courtesy of Biodiversity Ireland. Hi Dee, fantastic article and good on you for all your efforts. I’ve signed up for the biodiversity survey at the NBDC at the WIT West Campus. Dr. Úna Fitzpatrick gave me a swatch card for identifying bees and I highly recommend getting one. It’s given me a much greater appreciation of the variety of bees around. If it’s ok with you I’d like to take from your article for my blog. I found a paper showing how honey bees are sensitive to humidity and most likely attempt to regulate this in the hive. Consequently, climate change could have a big impact. Thanks for your comments Peter and well done on signing up for the survey, something I’d planned to do last year but time ran away from me. I was really surprised to learn there were so many varieties of hoverflies, it hadn’t occurred to me there were so many. Most of the facts and figures came from the Biodiversity Ireland Pollinator Plan, there’s heaps of info on the site. 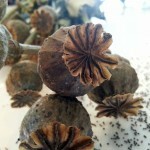 I spotted a dandelion and gin recipe somewhere, must try and find it again! A few thoughts from the US. When peers of mine from England have been using mason bees (a solitary bee that nests in holes) in Irish orchards alongside bumble bees, they found horrible results. It is believed that imported bumble bees are spreading diseases to native bees. The cocoon emergence was pitiful in comparison to mason bees not next to bumble bees. 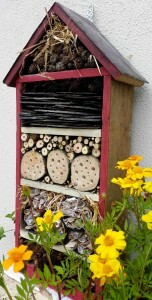 Bug hotels, while “popular” quickly become mason bee cemeteries due to pest build up. If you are going to provide a lot of holes for mason bees to use, it’s best to use holes that can be opened up like paper tubes, reeds or wood trays. Every bee matters. We have a Bee-Mail on our website (http://crownbees.com) that reminds people when to do what throughout the year. Amen on the chemicals. It’s even worse over here in the US. Thanks Dave and I’m no expert but yes, you’re correct about imported bees harming our own bee populations. Thanks Dave and yes, I’m no expert but I’ve heard that imported bees are causing harm to our native populations but it’s a popular practice in commercial fruit farms etc. 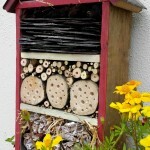 Thanks for the reminder about the need for bug hotels to be cleaned out regularly and fresh natural ingredients replaced each year to ensure pests and diseases don’t take over. Best of luck with your own products too. I recently went to a no-till seminar in Norfolk, Nebraska and Dr. Jonathan Lundgren talked on the research he has done on neoniconoids, it appears that they are what seeds are treated with and they will transfer to all the plants in the soil and after eaten will be distributed through animal and human waste into the water systems. the answer is to stop using them on seeds expecially corn, beans, alfalfa, wheat, rye, etc. and to plant biodiversity strips at 300 feet or 100 meter centers. that is the distance the pollinators will travel. put these strips down your cropland and leave them idle, have plants that bloom at various stages as you have outlined above, and use no till with cover crops. I am alittle unsure of the cover crop rotation. I am going to try winter wheat in the fall between my corn and beans, as well as potatoes. Yes! Leaving the strip along the edge is something the biodiversity centre are recommending to farmers but naturally there’s a cost to them as there’s less land being farmed. Hopefully they’ll understand the importance of pollinators though and consider it. Great to hear you’re planning on leaving space for them. There was a moratorium in Europe for neonicitinoides but not certain if that still stands. I would add that doctor Lundgren is with South Dakota State University and his research has proven that the neonics are what is killing the bees and other pollinators. In the fall not only winter wheat but a combination of winter wheat with other plants and will harvest the winter wheat and plant beans with no till after the harvest in early summer. I am wondering how we can do this notill and covercrops without using chemicals to kill the cover crops before the next planting. if anyone has ideas on this please let me know. There was a soil conference here in Galway last year organised by Klaus Laitenberger. I haven’t received the notes yet but there were various speakers that covered the topic of cover crops and little tilling, in particular Jim Cronin. You could try contacting Klaus at greenvegetableseeds.com and see if he has notes/more information.